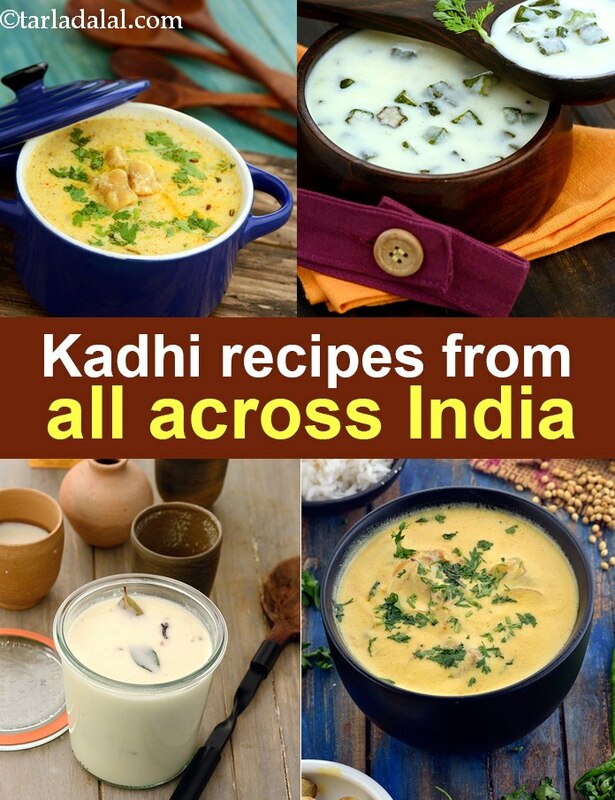 Kadhi Recipes, Kadhi recipes from all across India. Kadhis are made using curds, often enhanced with vegetables or pakode. From simple everyday kadhis to mouth-watering delicacies that use a large assortment of spices, you will find a wide selection of recipes in this section. You are also about to discover some enticing regional specialties like the Punjabi Pakoda Kadhi , Gujarati Kadhi and Gatte ki Kadhi . Enjoy our punjabi kadhis, Gujarati kadhis, Rajashthani kadhis, healthy kadhis given below. We have a good collection of Punjabi Kadhis. The Punjabi pakoda kadhi recipe has a unique bite with besan pakodas perked up with coriander, onions and green chillies. A variation to this is the methi pakoda kadhi recipe. Also, you can make fibre rich palak kofta kadhi recipe. They transform a simple, everyday kadhi into a more special dish, which can be enjoyed by the family and also served to guests. Add zest to life with this bone-strengthening kadhi! With a bouquet of healthy ingredients including curds, fenugreek, spinach and kabuli chana, the Chana Kofta Kadhi gives your meal a protein and calcium boost. Gujarati kadhi recipes. Dapka kadhi is one of the popular Gujarati kadhi recipes. Moong dal dumplings cooked in a traditional Gujarati besan-curd mixture, Dapka Kadhi served with rotlas, green chillies and garlic chutney is a sumptuous and satiating meal worth a million dollars! Also, the traditional Gujarati kadhi recipe with a hint of sweetness from jaggery or sugar is a perfect accompanimnet to a hot bowl of Khichdi. Rajashtani kadhi recipes. The highlight of the Rajasthani Pakoda Kadhi is the addition of crisp and fresh besan pakodas! This imparts a chewy, crunchy dimension to the kadhi making it more satiating. Gatte ki kadhi recipe is another well known Rajasthani kadhi which is available in Thali restaurants in Mumbai or at wedding functions. Gattas or "gatte" are gram flour dumplings that are spiced up with dry masalas and then steamed and cut into small bite sized pieces. This dish is made using a yoghurt based gravy and dry masalas to create a mouth-watering recipe. Maharashtrian kadhis, Konkan region kadhis. Coconut is widely used in this area. We have the coocnut kadhi recipe which is a rare combination of coconut milk and curds thickened with besan and flavoured with spices gives rise to a soothing yet flavourful taste. Another popular Maharashtrian recipe is the sol kadhi, which is not a kadhi but, a cooling drink that is served post meal to aid digestion. Always try and make some healthy kadhi, low fat kadhi. Avoid deep fried koftas and use healthy ingredients in your kadhi. Also a trick is to try and avoid the usage of sugar in your kadhi. You can even substitute full-fat curd with low-fat curd to make a healthy low-fat kadhi recipe. The radish koftas in kadhi recipe is a simple combination of radish and low fat curds which needs only steamed brown rice to complete your meal. You can adjust the consistency of the kadhi by varying the amount of water and besan. The radish koftas are steamed and not deep fried in the kadhi. It is also a good way to add vegetables in your diet to provide vitamin A and iron. The curd and besan combination makes the kadhi a rich source of protein and calcium too. Sprouts kadhi recipe gives your regular kadhi a nutrient boost by adding sprouts to it. The sprouts not only contribute immense nutrients and fibre but also a variety of textures, which makes the kadhi more toothsome. Karela kadhi recipe is a super option for diabetics. Made with karela and low fat curds and zero sugar added to it. Sindhi cuisine is very nutritious with a predominant use of vegetables in each and every dish. Sindhi kadhi recipe is one such example where all the vegetables are used beautifully to complement each other in taste, colour and texture. Tamatar ki kadhi is another popular Sindi kadhi made with tomatoes. You can add myriad of vegetables to make it more delicious and nutritious. Enjoy the tamatar kadhi with brown rice to make a wholesome meal. Enjoy our Kadhi Recipes, Kadhi recipes from all across India and other dal, kadhi recipe articles below. Serve this gujarati delicacy in any party, and keep that winning smile ready for you will be accosted by one to many compliments! the addition of moong sprouts gives your guests a health boost as well as a tasty treat.